A cheque for almost £20,000 is being presented to the North Cornwall Flood Disaster Trust on Saturday. It has been collected by the Mayor of Saltash who set up a fund after seeing the devastation caused by the flooding in Boscastle and surrounding villages. It brings the main fund up to almost £400,000. Councillor Sue Hooper will hand over the money at the Saltash Guildhall at a ceremony on Saturday. She said she was delighted with the large amount raised. Mrs Hooper said the money has come mainly from local people, but she has also received donations from Devon and across the UK. Councillor Graham Facks-Martin, the Chairman of Trustees for the North Cornwall Fund said the mayor's cheque brings the total fund to £380,000. £200,000 has already been paid out to individuals and businesses in need of immediate help. 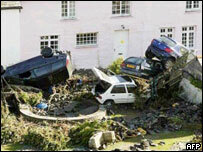 The floods on Monday 16 August caused millions of pounds of damage. A 3m (10ft) wall of water crashed through the village when 77mm (3in) of rain fell in just a couple of hours.